Do you remember how it felt to sit in one of these? The old school desk was the asana ("seat" in Sanskrit) that propped us up in school as we learned grammar and arithmetic, and maybe a few extra-curricular tricks. As kids we sat in class with the spine upright and mula bandha rooting the sit bones on the wooden plank, while we learned conventional labels and concepts to harness our creativity and empower our intellect. Now our butts may be a bit too wide to fit into one of these desks, and our minds may have since become cluttered with notes, memories, choices, concerns and a million other vrittis (thoughts).... but many of us are back - back to (yoga) school and raising our hands high. 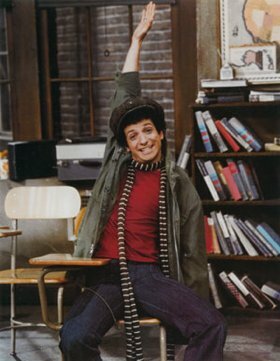 The boys on Welcome Back Kotter were famous for repeating the same academic year over and over. We too may have that feeling of facing the same yoga poses with the same obstacles as in years past. Let’s not forget, however, that there’s reason for hope and enthusiasm: now we’re different than we were before. Our mental citta (mental capacity) is more refined. According to the philosophy of yoga, the consciousness, like the body, is always changing, developing, and evolving. Read the same book now as you did last year, and your mind will process it differently. Not just because of your experience and thoughts over the past year, but because the terrain of your mind is inherently different. The good news is that now we have new capacity to realize the essence of life, the permanent, unchanging Truth beneath the rolling swells of thoughts, emotions, feeling and so much other information in our lives. That's what yoga is for – to purify our mental and physical space. That is what we all have the possibility of learning in the asanas we make on the mat. We may be trying to rekindle the spark of joy and playfulness that bubbled out of us when we sat in these little desks as kids. We may be determined to get back those slim waist lines and flexible limbs that seated life has since turned into distant memory. These possibilities, although still there, are but ephemeral whims. Our deepest desire, underneath all other stuff that may make yoga appealing, is seeing the mind and body for what they are now, and connecting with the part of us that has always been. This, I think, is as practical and relevant as anything I ever learned in school. Welcome back.